Well, well, well, the Federal Aviation Administration has gone and done something the flight attendants on one of my recent flights would not do. It's gone and talked tough to a iPad wielding air traveler who thought the rules regarding using electronic devices below ten-thousand feet did not apply to him. Correction, Grant Cardone, the fella en route to LA from NYC on Delta, did think the rules applied to him, or so he told CNN's Soledad O'Brien, just not this particular one. "To think that a device, a telephone or this iPad can take down a plane is ridiculous, because figure 90% of all people in America now have an iPhone on them," Cardone said channeling the digital generation's favorite in flight device-user, Alec Baldwin. Well the next thing you know the video is on You Tube. But here the FAA goes uncharacteristically aggressive on an issue it's been mincing around since my first story on this was published in The New York Times 14 months ago. In a letter Cardone shared with CNN, the FAA wrote, "Your failure to comply with flight attendant instructions could have affected the safety of this flight." The agency charged with ensuring the safety of the flying public then suggests it could take legal enforcement action, but this time, it will not. Numbskulls like Cardone who deceive themselves - if not others - into thinking they abide by the rules but the rules don't count if they don't like them, are part of the problem. Another problem is airlines and an FAA that is wishy-washy about the rule itself. On a flight from Atlanta to Charleston last week, I sat next to a young man who was playing his iPod in full view of me and the Delta flight attendants who were doing the seat-belt check. When we were wheels up and I could no longer contain my busy-body self I asked him, "When do you plan to turn off the iPod?" and he said, "I'll play it until I get caught." So its no surprise to me that passengers get confused. The airline is sending mixed signals and its not just Delta. 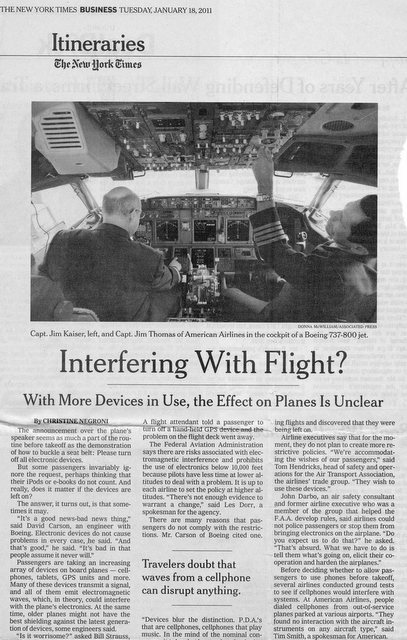 When airlines tell their flight attendants to treat the use of personal electronic devices below 10 thousand feet as hard-and-fast as the rule that prohibits economy class passengers from using the premium class loo, then I think we'll be making some progress. Maybe this toad read the articles advertising that the FAA has OK'ed use of i-Pads in the cockpit, that conveniently omitted the caveats against using them to send-rcv, which are really the times that there might be interference, including auto modes that most non-EEs don't understand asnyway. 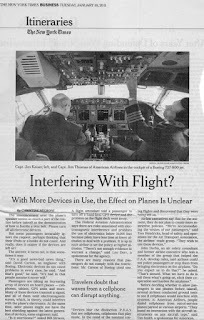 In any case, the FAA would look more foolish than usual co-opting an i-Pad video that "might" cause interference rather than arresting the geese that actually did. This week the Chief Operating Officer of JetBlue, Rob Maruster, publicly flouted the same rule. He tweeted a picture taken from an airplane (coach in an American Airlines plane no less?!) as it was taxying out of JFK. Unless he snapped it with a Polaroid and tweeted it using a real carrier pidgin, his phone certainly wasn't powered all the way down (not airplane mode) and was actually still in phone mode. Since he sets the standards for JetBlue flight attendants maybe the FAA should go after him? Interesting point Anonymous. I've asked Maruster to comment. Stay tuned. The rule says, "Off." What is it about that word y'all don't understand? I've angrily told many seat mates to power down. Since I no longer non-rev with my former employer, I am no longer intimidated to speak up.